Bhutan Center for Media and Democracy (BCMD)’s project “Strengthening democracy in Bhutan through enhancing civil society space and inspiring active and engaged citizenship”, aims to work with civil society members and vulnerable groups to be more effective actors in democracy through enhanced leadership, advocacy, networking and awareness on media, democracy and citizenship. A CSO Retreat, with 44 (28M, 16F) participants from the civil society fraternity got together to review key challenges and opportunities for CSOs. It resulted in the drafting of a strategic framework for creating a more conducive and enabling environment for the CSO sector. Besides this, the retreat also identified some key strategies to carry forward the vision and mission; on the need to work with the government on a policy for civil society growth, development of advocacy & lobbying of civil society work and the need to call on government to create guidelines to enable CSOs to be partners in the 12th five-year plan period. A leadership training for mid-level CSO staff (12M, 9 F) was also carried out to reflect on their lives, character and personality and start a journey of transformation on becoming effective leaders. A training on media and democracy literacy for CSOs was also carried out. 16 male and 8 female representatives from CSOs attended the training. 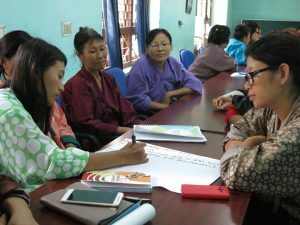 The training provided awareness of Bhutan’s democracy and the responsibility of its citizens to know the difference between real and fake news, how to counter those who would manipulate media to hurt the country’s developing democracy. The participants represented diverse backgrounds; included a monk, nuns, communication officers, CBO representative, teachers, program officers, outreach workers and textile conservators. The major challenges faced by BCMD during the implementation was the inability to conduct “public” events due to election year, and difficulty to get anticipated full participations from CSOs since everyone was operating within the tight open schedule before the elections.